Bagrada bug, Bagrada hilaris (Fig. 1) continues to be a major pest of brassica crops in the Salinas Valley and Hollister causing severe crop losses for both organic and conventional growers alike. Organic growers are struggling because there are very limited options at disposal to suppress the bagrada bug populations in the field. 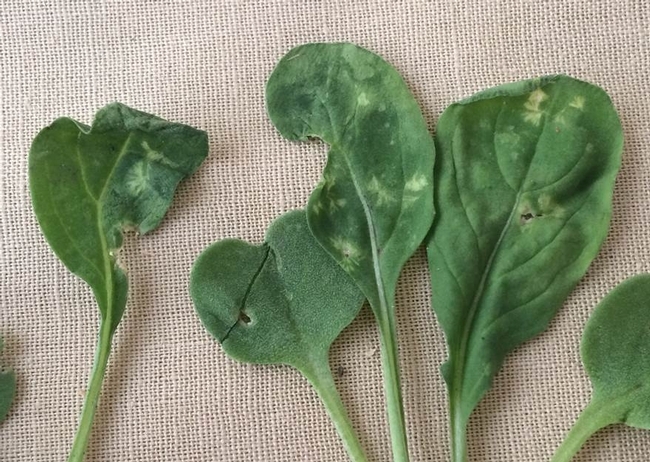 Conventional growers on the other hand are relying heavily on pyrethroid and neonicotinoid insecticides and are going with more number of applications than normal during early stages pf crop development (Cotyledon to four true leaves stage). This tactic (multiple applications) benefit the young seedlings as insecticide residues protect the plants from bagrada bug feeding especially, on the growing point or apical meristematic tissue. Feeding injury to meristematic tissue would cause “blind” head (no head) and multiple shoots on heading brassica crops such as broccoli, cauliflower or cabbage. 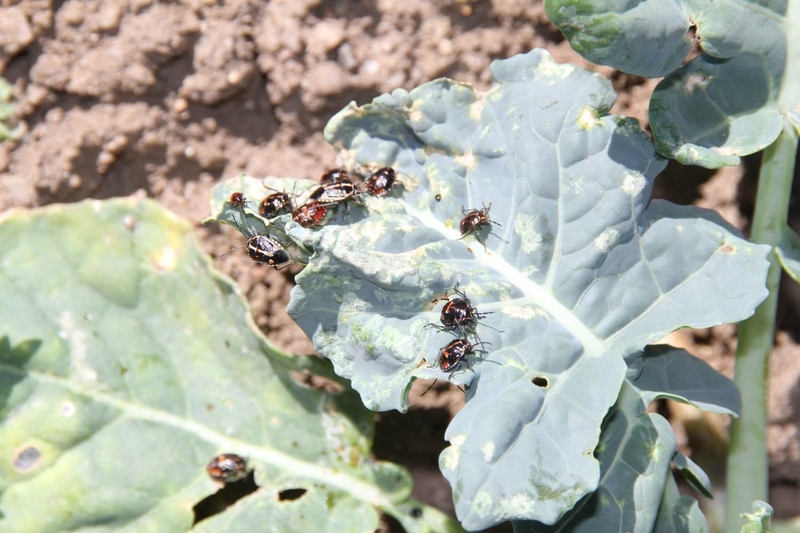 With couple of insecticide applications at early stages of brassica crop, conventional growers are facing 5-30% loss from bagrada bug feeding injury. Some growers finding noticeably high mortality of cotyledons forcing them to skip thinning operation to maintain a decent crop stand. Bagrada bug is taking a huge toll on leafy brassica crops such as Chinese cabbage (Pak Choi or Bak Choi), Arugula, Mizuna, Totsoi and Kale. 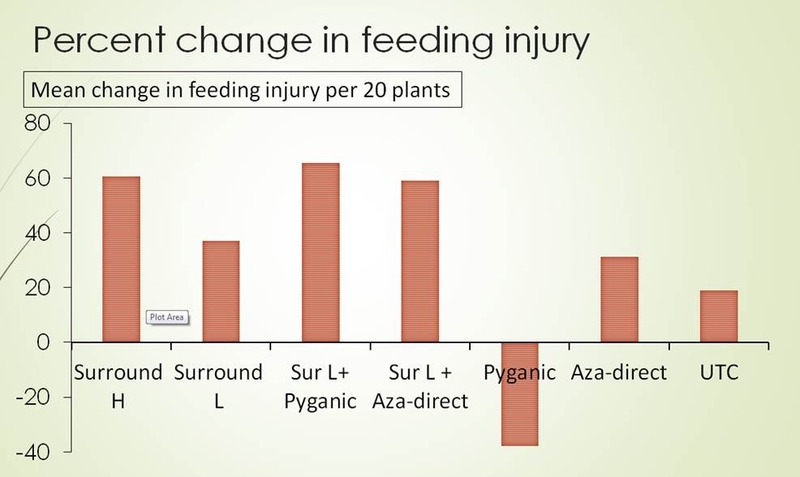 These crops become unmarketable from direct feeding injury on the leaves (Fig. 2). These crops are like “magnets” for bagrada bugs. Bagrada bugs can precisely detect the seeds planted in the soil and most of the seedlings emerge with bagrada bug feeding injury. 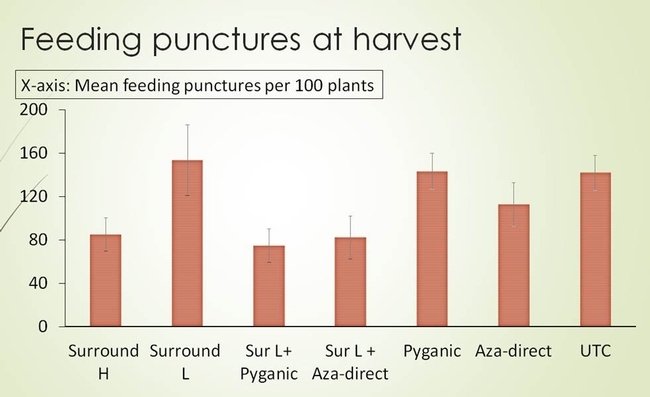 Sometimes, severe feeding at young stages cause plants die upon emergence (Fig. 3). 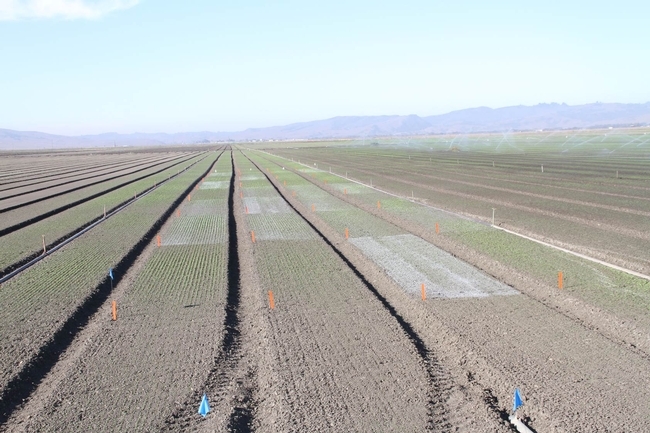 Two field trials were conducted in Hollister seeking organic insecticide options for bagrada bug management. 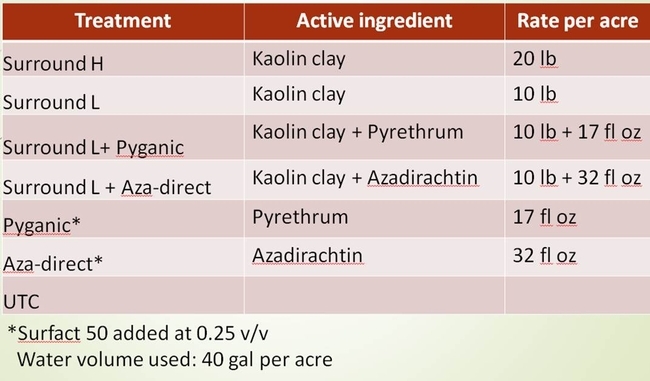 The insecticide products chosen were Surround (Kaolin clay), Pyganic, Aza-direct, Entrust and M-pede. Surfact 50 was added when the Pyganic and Aza-direct were used alone. 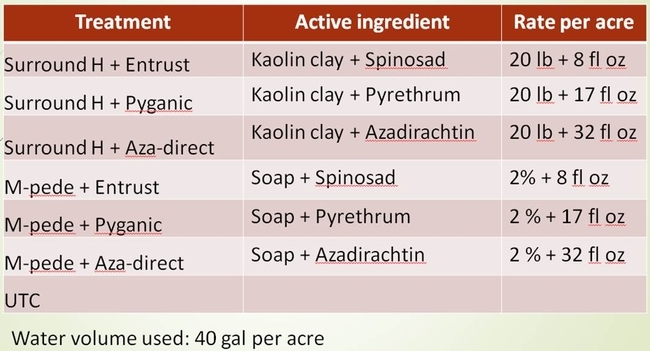 These organically approved insecticides were combined with other insecticides based on certain assumptions. For example, when insecticide Surround is sprayed, it forms a thin particle film on the leaf surface without affecting light transmission or photosynthesis. As bagrada bugs crawl on the Surround treated surface, the particles could stick to their body possibly cause irritation and force them to crawl off from the treated surface. This phenomenon if occurs, it could reduce the incidence of bagrada bug feeding injury. Moreover, it is possible that combining insecticides such as Pyganic and Aza-direct with Surround may increase insecticide exposure as bagrada bugs groom to remove the clay particles stuck on their body using their legs or wings. 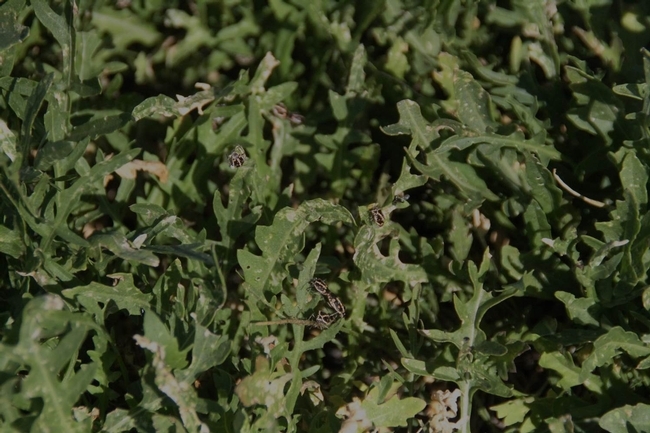 The field where the trials were conducted had enormous bagrada bug pressure. Bagrada bugs were everywhere that one would easily kill “thousands of bugs” just by walking over the beds. All stages of bagrada bug were present in the field at the time of insecticide applications. The applications were targeted to protect the plants from feeding injury and not particularly to kill the bugs. The first trial was conducted in Mizuna field and the second trial was conducted in Arugula field. In both the trials, the products were applied four times at three-day interval until harvest between 7 AM and 9 AM. The water volume used was 40 gal per acre. The products were applied using the pneumatic sprayer or back pack sprayer. The details of the products, active ingredients and the rates used for the trials are shown in the Tables 1 and 2. The design of experiments was Completely Randomized Block Design with four replications (Fig. 4). Plant samples were collected twice a week and were evaluated for bagrada bug feeding injury on the true leaves (Fig. 5). 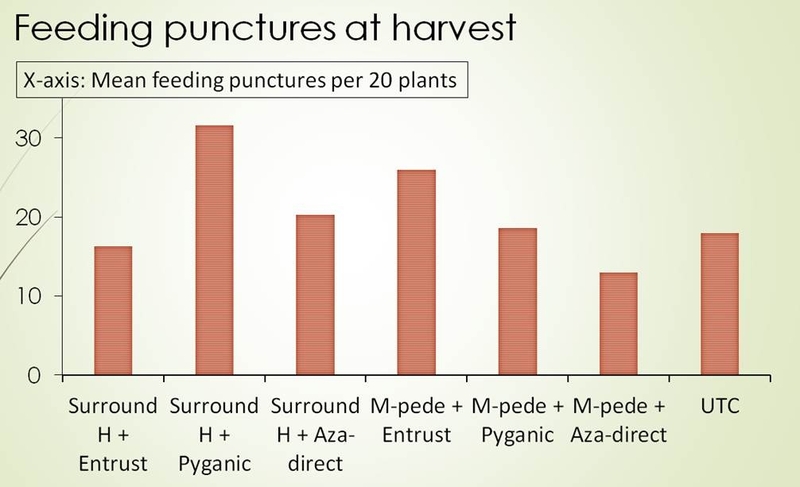 In trial 1, the bagrada bug feeding injury was numerically lower on Mizuna plants that received higher rate of Surround (alone) and Surround combined with Pyganic or Aza-direct than on untreated plants (Fig. 6). 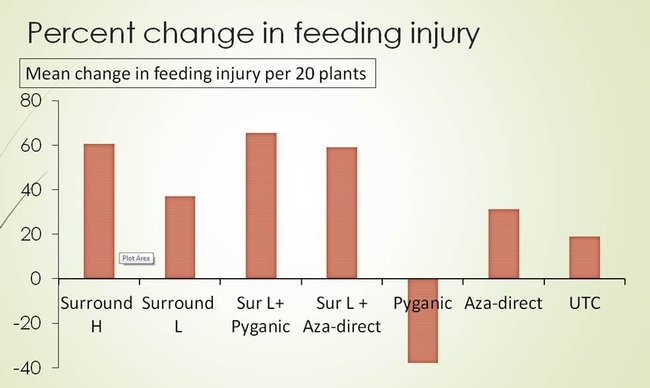 When the percentage change in bagrada bug injury on true leaves was calculated (taller the histogram, better the product performance), the plants treated with higher rate of Surround, and Surround combined with Pyganic or Aza-direct had greater reduction of bagrada bug feeding than untreated plants (Fig. 7). In trial 2, none of the treatments showed any indication of suppression when compared with untreated plants (Fig. 8). Basically, these studies did not provide definite answers to the questions posed or problem but provided some trends. 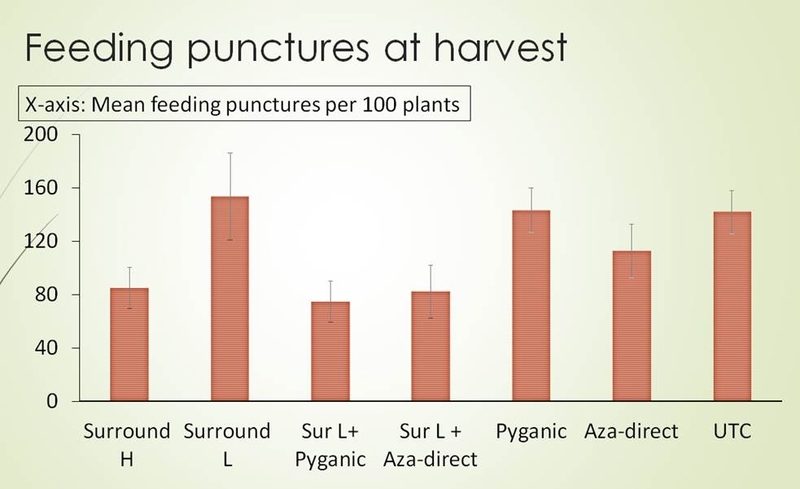 It appears that combining Pyganic or Aza-direct with Surround may have some value rather than applying alone. The Surround rate 20 lb per 40 gal of water is maximum rate for this product. Because Surround could clog the spray tanks, it requires rigorous agitation before application. Also, because Surround easily comes off from the leaf surface with sprinkler irrigation, reapplications are warranted if irrigated at closer intervals especially during the early stages of the crop. The rate of M-pede used in the study was 2% of the water volume. 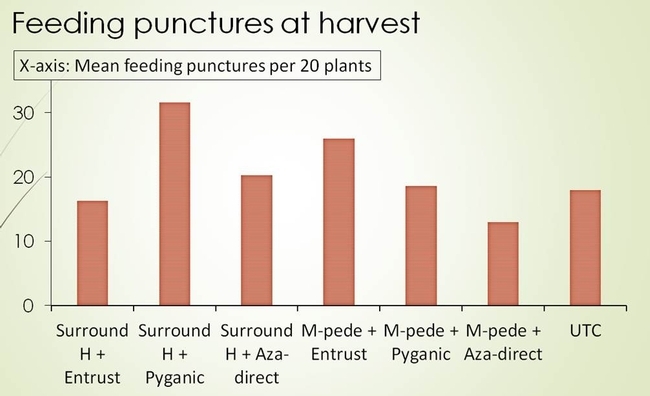 Typically, 2% of M-pede is considered as a high rate and increasing the rate (> 2%) may cause phytotoxicity (burning of leaves). Then, can we manage bagrada bug? Perhaps, we should approach this problem differently. Bagrada bug is a landscape scale pest that they could reproduce and build-up to huge populations if the food is available in plenty, and warm and dry conditions persist. So far, we learned that their population build-up starting late July to December in the Salinas Valley and Hollister. The warmer conditions favor rapid reproduction and several overlapping generations of bagrada bug would develop in short period. We observed that their population pressure vary across landscapes and is a serious problem where the control options are limited. For example, bagrada bug problem is less severe when the management is aggressive such as conventional fields where growers have effective products that could suppress or knock down their populations at least in the crops grown. Organic growers on the other hand have limited options to fight bagrada bug and its population rapidly grows into uncontrollable size. We also noticed that initially these bugs invade the plants in the edge of the field from the surrounding fields or risk zones (e.g. ditches). These facts suggest that this is a landscape level problem rather than a field level problem. Bagrada bug management approach probably should include the management of various kinds of hosts that function as reservoir (e.g. brassica weeds) and aid to sustain their populations (brassica crops). Cultural management: Avoid planting brassica crops back-to-back pattern or staggered pattern. This would provide opportunity for bagrada bug to utilize the continuous supply of food to reach uncontrollable population size in short period of time. If somehow, the growers could disrupt the ecology of bagrada bug by not growing brassica crops in succession for a period instead rotate with non-brassica hosts, their population might crash and reach to a controllable levels. Weed management: Aggressive weed management especially brassicaceous weeds along with tight cultural management would disrupt the food supply and prevent escalation of population size. Bagrada bugs have demonstrated the ability to survive on non-brassica hosts especially solanaceous crops such as tomato, potato or pepper but would rarely reach to the levels we are seeing in brassica fields. For further reading on bagrada bug please click on the following links (UC IPM pest note or blog articles). Please contact me (Shimat Joseph) by email at svjoseph@ucanr.edu or phone at 831-229-8985 if you have any questions or comments. Figure 1. Bagrada bug attacking broccoli plant. Figure 3. Dying Arugula seedlings at emergence after bagrada bug feeding. Figure 4. Experimental plots with Surround treatments (white). Figure 5. Classic "star burst" feeding injury on Arugula leaves. Table 1. The products, active ingredients, and rates in Trial 1 in Mizuna. Figure 6. Trial 1: Effect of organic treatments on bagrada bug feeding injury on Mizuna leaves (refer Table 1). Figure 7. Trial 1: Percent change in bagrada bug feeding injury after application on various treatments (refer Table 1) in Mizuna. Table 2. The products, active ingredients, and rates in Trial 2 in Arugula. Figure 8. Trial 2: Effect of organic treatments on bagrada bug feeding injury on Arugula leaves (refer Table 2). The wait for the Third Edition of Grape Pest Management is over. 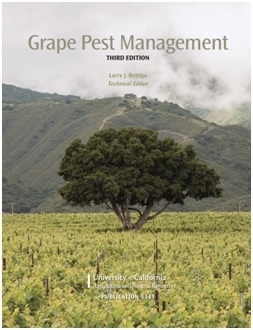 The new edition of this popular resource, first published in 1981, consolidates knowledge of the biology and management of pests that affect California wine, raisin, and table grape vineyards, in one comprehensive, highly readable source. Grape production in California had a farm gate value of $4.4 billion in 2012. Because grape pests affect both the quantity and the quality of grapes, the goal of grape pest management is to minimize economic losses through pest management practices. At nearly 650 pages, the third edition of Grape Pest Management was written to help growers and pest control advisors apply the principles of Integrated Pest Management (IPM). IPM is an integrated pest-management approach that combines methods that work better together than when applied separately; thus it remains the most effective, long-term strategy for managing pests. Grape Pest Management can assist growers in implementing the best possible management practices. 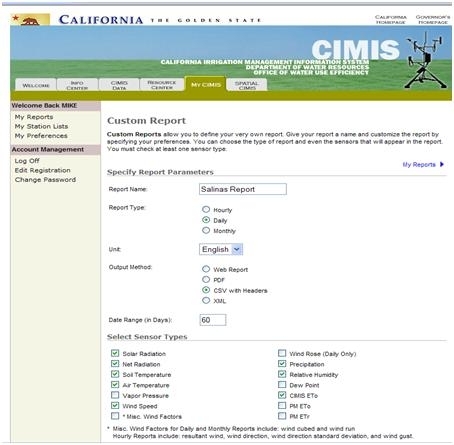 Access to weather data from the California Irrigation Management and Information System (CIMIS) has become easier than ever due to improvements in the website (www.cimis.water.ca.gov). CIMIS is managed by the CA Department of Water Resources. CIMIS is a network of more than 120 weather stations that operate through out the agricultural regions of California. Currently, 13 stations are located on the central coast (Figure 1). All stations record relative humidity, air temperature, wind speed and direction, and solar radiation, and are located above a standard crop of grass or alfalfa, which are referred to as reference crops. Using these weather data and a mathematical model (Penman-Monteith) , potential crop water use, also called evapotranspiration (ETo), of the reference crop can be estimated. 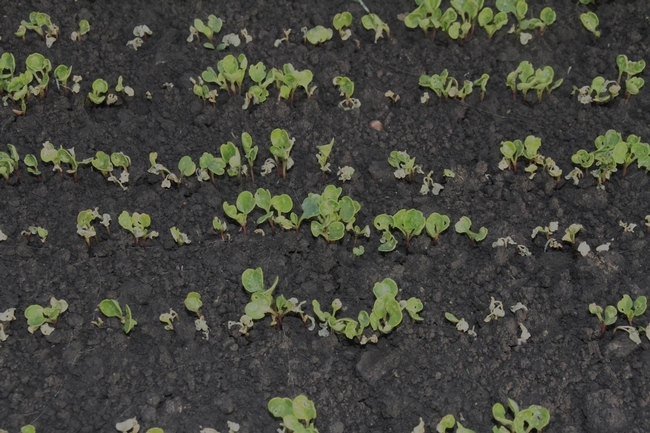 A crop coefficient is used to adjust the reference evapotranspiration data to evapotranspiration estimates for other crops, such lettuce, strawberry, or celery. CIMIS weather stations also monitor precipitation and soil temperature, and the stations calculate dew point, net radiation, and vapor pressure from the collected data. The CIMIS staff has made many improvements in managing the weather data over the years. They use computer algorithms to check for outlying values which are flagged in reports. They have incorporated google maps to help you locate CIMIS stations near your fields (Figure 1), and they have incorporated Satellite weather data to help improve the spatial resolution of CIMIS evapotranspiration estimates. Go to the CIMIS website and sign up for a user ID and password on the My CIMIS tab. (There is no cost for signing up and CIMIS does not send you annoying email solicitations). After logging on at the My CIMIS tab, select the station(s) from which you would like to receive weather data. Add the stations to a list. Under My Custom Report select “customize” to create a report. Choose the file format, station list, weather parameters, and time period (1 week, 2 week etc) that the report should cover (Figure 2). 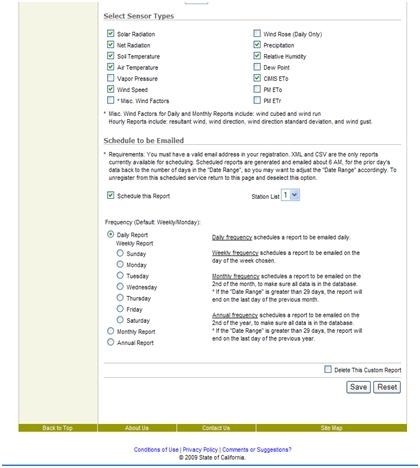 You can check the box to schedule the report to be automatically emailed to you (Figure 3). Note that the CSV format can be imported into Excel. The web report can be viewed directly from your web browser. Figure 1. 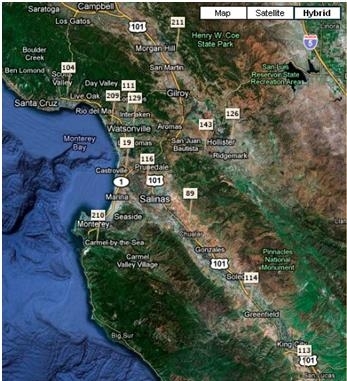 Location of currently operating CIMIS weather stations on the central coast as viewed from station location map under the Spatial CIMIS tab. Station numbers are displayed in the white rectangles. Figure 2. User can select weather data and file format on the Custom report screen of My CIMIS tab. Figure 3. User can select to have report emailed on the Custom report screen of My CIMIS tab.